DAPCU, Kurnool is one of the A category districts in Andhra Pradesh. We have been implementing and practicing the following process to link PLHAs to ART center as well as reducing the LFUs in our district with the support of the entire district team. DAPCU Kurnool facilitates and conducts meetings with ART Centre and Care and Support Centre (CSC) on fixed dates every month to focus on LFU and MIS cases with the involvement of Network, NGOs and LWS staff. We have been conducting LFU Special Drive every year to re-start the LFU, MIS cases, collecting evidence based information on death cases and linking PLHAs with care and support services. Seven Link ART centers have been established at route corner areas in the district. 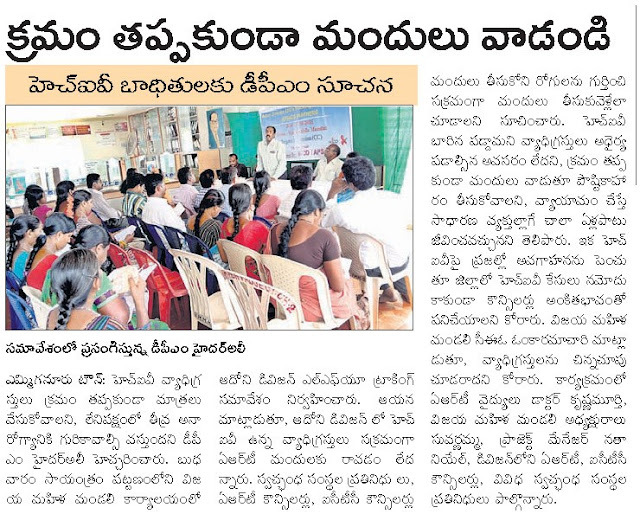 Providing free bus pass to PLHIVs and 50% concession to the Attender twice a month with the support of APSRTC. Conducted sensitization for APSRTC bus conductors and depot staff on HIV/AIDS and free bus passes to PLHIVs and avoiding stigma and discrimination. DAPCU Kurnool is facilitating access to social security benefit schemes for PLHIVs through DAPCU Led Single Window Model with the support of line departments as well as District Collector. Sensitization meeting facilitated by DAPCU Kurnool for ART centre and ICTC Counsellors and Mahila Mandali representatives. Participants were sensitized on tracking and reducing LFU cases and importance of taking ART medications without missing any doses.